During Spring migration, it’s standing room only at Tucson Audubon’s Paton Center in Patagonia, Arizona. Birders crowd under and around the beautiful new viewing pavilion much like they did years ago under the old canopy that my parents, Wally and Marion Paton, erected in their yard. Back then there was an assortment of chairs scattered around- metal folding, plastic lawn, a bench or two and old kitchen chairs. They brought a sense of hominess to the place. On April 14, 2019, Tucson Audubon reported 40 different species of birds at the Paton Center, as well as 8 different hummingbird species, including the bird that put the place on the map – the Violet-crowned. This is the draw – the ability to see so many different birds – perhaps a life bird – while sitting in the company of fellow birders sharing stores and recent birding news. A lot has changed since Tucson Audubon took over what was once known as Paton’s Birder Haven. Now called the Paton Center for Hummingbirds, there are more feeders, a new Monarch Waystation, a pond and a meadow fill the area that was once our horse paddock, fruit trees have been planted to mirror my Dad’s former orchard. An army of volunteers have replaced my parents – two devoted and generous people who turned their back yard into a birding mecca. Wally & Marion Paton dedicated their later years to serving the birding community – committed to both the birds and the birders. The volunteers carry on their legacy showing up every day to keep the place going – feeding birds, digging trails and ponds, building fences, planting bushes and flowers. Each year during Spring migration I am reminded of all those who make their return journey to this paradise – a journey home of sorts for both the birds and the birders. There are more improvements in store. 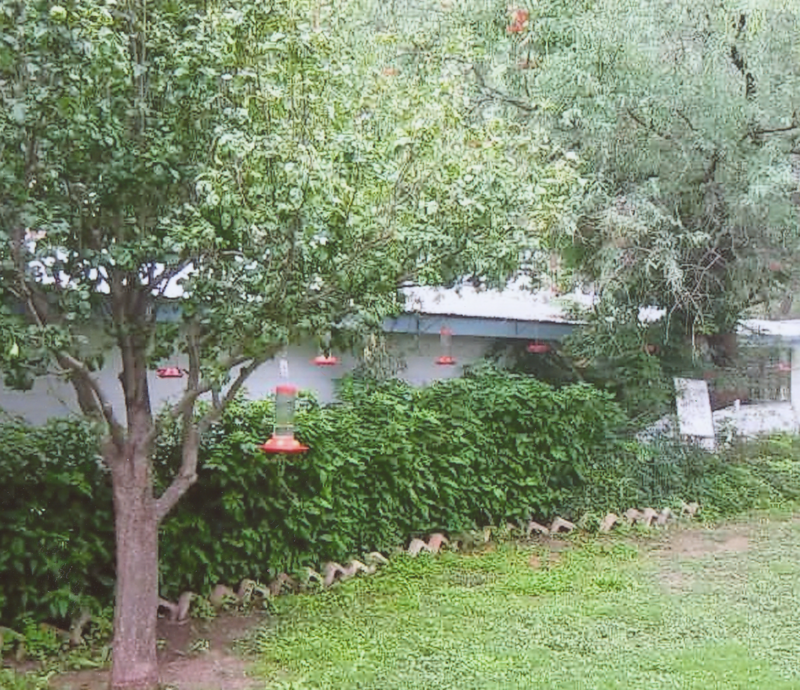 Tucson Audubon recently wrapped up a successful fundraising campaign for improvements to the home. There is no doubt that improvements are needed, but it is my sincere hope that the essence of the place – the so called “Paton Effect” will never be lost. It is, I believe, what keeps Patons on the map. “For every person who appreciates nature and birds, this yard is a beloved home one visits to renew one’s spirit; to experience the joy of the beauty of a quick flash of metallic colors adorning these jewels of nature, and to hear a sweet courting song, a dazzling display flight, or thrill to the sight of a rare bird. I hadn’t journeyed home to Patagonia in awhile, but this trip was a celebration I would not miss – the three-year reunion of Paton supporters who had been instrumental in “saving” Paton’s Birder Haven. The weekend also marked Tucson Audubon’s Capital Campaign Kick-off to fund improvements to the house. While there, I had the great honor of sharing from my book, Journey Home: How a Simple Act of Kindness Led to the Creation of a Living Legacy” — the story about my parents, Wally & Marion Paton and the creation of their world-renowned birdwatching backyard. Entering the yard, so familiar, yet different now, I was immediately struck by all the improvements completed by Tucson Audubon Society since my last visit two years ago. My first stop – the Paton Legacy Sign erected in the front yard. What a thrill to see my parents honored for creating this birding mecca that still attracts thousands of visitors each year from all parts of the globe. While reading the sign, a couple from British Columbia approached — their first visit to Paton’s. “Where do we pay?” was their first question to me. “There is no entrance fee,” I replied — a tradition my parents established decades ago and continues today. The “sugar fund,” originally an old coffee can hung on the fence, now a spiffy donation box, remains strictly voluntary. After three glorious days during which Paton supporters were treated to some fabulous spring migration birding, tours of the property by various Tucson Audubon staff involved in improvement projects, talks by hummingbird expert, Sheri Williamson, of Southern Arizona Birding Observatory (SABO) and Jesus Garcia, Director of the Kino Heritage Fruit Tree Project at the Arizona-Sonora Desert Museum, it was time to say goodbye once again. As I wandered the property on that last day, I spent a few moments in the yard reflecting at some special spots. My Dad’s pecan tree still thrives in the back yard, bigger and more robust than ever, still producing a good amount of pecans each year. I sat a good while on my parents’ memorial bench and reflected on the beauty and peacefulness of this place — the land they had nurtured for decades, still loved and nurtured. The bench had been positioned near to the site of my Dad’s former orchard in the front yard. Plans to re-establish an orchard here are underway. Jonathan Horst, Restoration Ecologist, is heading up that project. I stopped to remember my Mom’s rose garden in the front yard, ready to pop with bloom — her passion. I sat on a bench in the Richard Grand Memorial Meadow with Carol and Paul Lamberger, long-time Paton supporters. We sat for a good while at this peaceful spot overlooking the newly created pond — all possible because of the kindness and generosity of Marcia Grand and the hard work of Tucson Audubon staff and volunteers. Then a very special moment happened. As I was getting in the car to leave, Carol Lamberger inquired if the rose bushes in the front yard were my mothers. “Yes,” I answered, “she loved roses. We would always gift one or several at Mother’s Day.” Carol smiled and then promised to take special care of them for me. And in that moment I was reminded of the special magic that surrounds Patons — it seems to bring out the very best in people — it always did and continues to do so. It is the underlying essence of the place and that spirit of kindness and generosity that my parents exemplified that will continue in perpetuity. In addition, of course, to remaining one of the top birding sites in the world. When our local library first announced in their monthly newsletter that they were embarking on a campaign to promote the Library with a series of “geek” photos I filed it away in the back of my mind and forgot about it. As the weeks passed, I noticed more and more pictures being posted on the Library website of people with items that they “geek”. All kinds of subjects appeared on the Library website “geek” page. Patrons were geeked with their favorite animal – many dogs of different breeds, and cats, Earthplace was geeked with their resident owl, grandparents geeked their grandkids, siblings and lovers geeked each other, sports enthusiasts showed up with skis, tennis rackets, soccer balls. Even some notable patrons like David Pogue, former New York Times Technology Writer and Tech Correspondent for CBS Sunday Morning showed up to “geek” technology and music. Pogue who has filmed four specials for Nova and currently writes his “TechnoFiles” column for Scientific American also geeks music. As the Library “Geek” campaign continued, the proof of my book Journey Home arrived on my doorstep — the story about my parents, Wally and Marion Paton, who over the course of several decades created a world-renowned birding “mecca” in their back yard. I had spent the prior 2 1/2 years in efforts to preserve and protect their tiny 1-acre parcel of birding paradise in Patagonia, Arizona which became known as Paton’s Birder Haven and is now called Tucson Audubon’s Paton Center for Hummingbirds. Visited by thousands each year from all corners of the world, it all started because of a rare and unusual hummingbird species, the Violet-crowned Hummingbird. These flying jewels showed up at my parents’ feeders creating quite a stir in the birding world. Such a stir that well-known wildlife photographer, Arthur Morris from NYC came knocking at my parents’ door one day in 1992 with his camera equipment wanting to take some photos. He took lots of photos and when he returned to New York, Mr. Morris wrote an article entitled “Hummingbird Hosts” which appeared in Bird Watcher’s Digest. That encounter and the decision that it sparked in my parents’ minds would change the course of their lives and the lives of thousands of birders and wildlife enthusiasts forever. What better subject for me to “Geek” than hummingbirds along with my newly completed book, Journey Home – How a Simple Act of Kindness Led to the Creation of a Living Legacy. So I made a note in my weekly calendar to go to the next “Geek” photo session to have my picture taken with the single thing that I am overly excited about these days. Five hundred and nine library patrons were “Geeked” — I was proud to be among them and to share my parents’ story.